The disastrous loss of human life on Turkey’s Gallipoli Peninsula between April and December 1915 prompted a wave of shock and grief in Australia and New Zealand. When the ANZAC casualty lists were published and digested, two questions were most pressing. How could so much personal grief be managed? What might the two nations do to commemorate their war dead? Throughout both Dominions politicians, leading citizens and churchmen were advancing schemes to help both nations move forward. Above the cacophony of discordant voices, an Anglican priest from Brisbane – Canon David John Garland (1864–1939) – attracted the attention of those seeking to redeem the loss of so many souls from the spectre of terrible waste. His previous experience as a secretary-organiser of the Bible-in-Schools League on both sides of the Tasman had made him a household name in Australia and New Zealand. By the end of his life, Canon Garland became known as the “architect” of Anzac Day and was widely esteemed for promoting a vision of commemoration that spanned the trans-Tasman experience of war, that honoured the war dead and brought comfort to those who mourned. 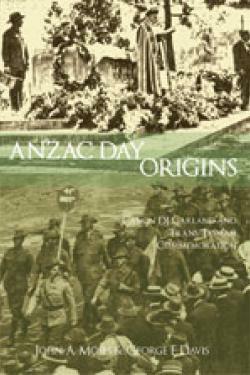 Anzac Day Origins addresses the often vaguely understood beginnings of Anzac Day in Australia and New Zealand, and adds significantly to the self-understanding of both nations.